Succinct comments accompanied by blackball related photographs. Click on any image to view in a larger size, then make further selections from the index of all enlarged photos at the foot of the album screen. 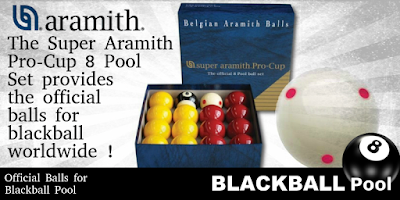 Super Aramith Pro-Cup 8 Balls. 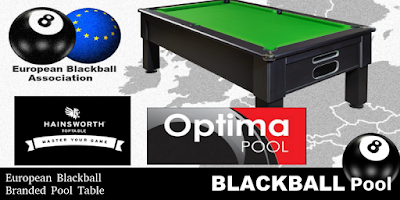 These are the official balls currently used at the World Blackball Championships, European and IPA Tour events, Golden 8-Ball Tournaments, plus a whole host of other events across the United Kingdom. Slightly heavier than standard, each ball is evenly matched in terms of weight and response. 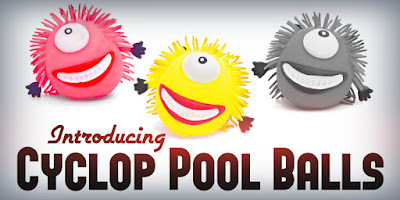 It was thought that Cyclop pool balls would be used for the (now cancelled) 2018 World Blackball Championships in Australia. Like the mythological giants XHIN BIING are dedicated master craftsmen who are persistently pursuing perfection. 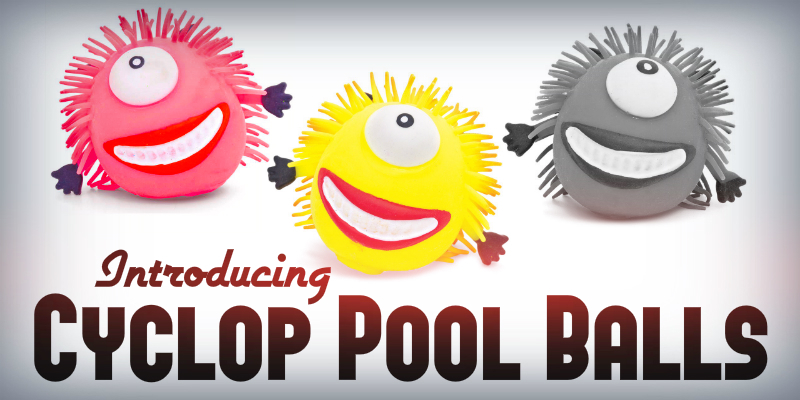 Made from a new revolutionary material they may play a little differently from other balls. The World Blackball Championships in 2014 were held in Perth, Scotland. Winners were Claudio Cassar of Malta and Sabrilla Brunet from France. The men's team event was won by Wales and the ladies' by England. View how competing nations shared World Championships honours from 2006. 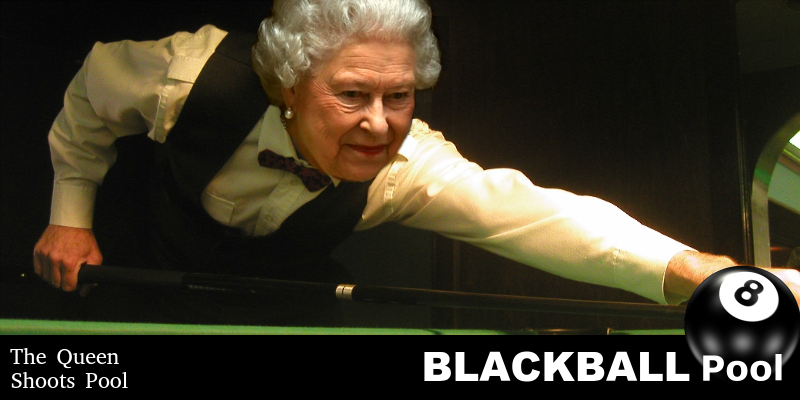 Queen Elizabeth plays blackball in the Buckingham Palace fun and games room. Her Majesty attributes her robust health and long reign to a lifetime dedicated to shooting grouse, pheasants and pool. 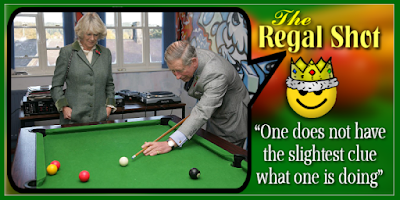 Other Royals and politicians including the Prime Minister are known to play the game. In 2015 the European Blackball Association launched a competition pool table. The ‘Optima Match Table’ was created with the help of partners Yorkshire textile mill Hainsworth and Manchester’s Optima Pool. It was unveiled at that year's Nations Cup in Killarney, Ireland. These are the Scottish Ladies who competed in the European Blackball Association's 2015 Nations Cup in Killarney, Ireland. 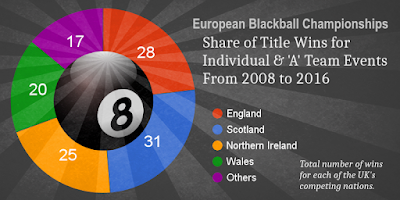 The EBA is the governing organisation to which European blackball playing countries, including England, Scotland Northern Ireland and Wales are affiliated. 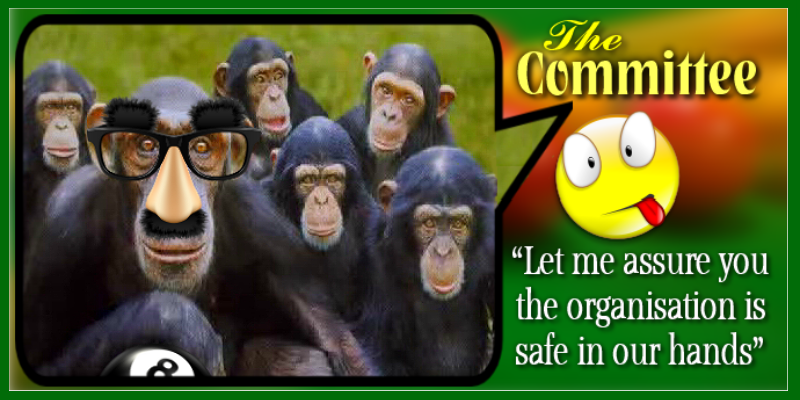 The committee celebrates its own wonderfulness with a selfie following yet another purposeless executive meeting. We owe so much to those dedicated and selfless individuals who have such a remarkable aptitude for keeping minutes and wasting hours. Eternally destined to butcher or strangle any promising ideas. Miss Piggy the cheerleader is showing her support for her blackball pool team. 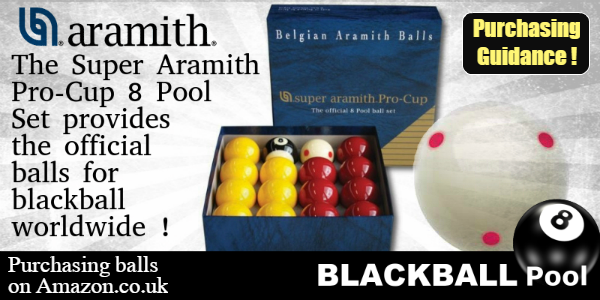 It would be fun if the Muppets were a team in your local blackball league! 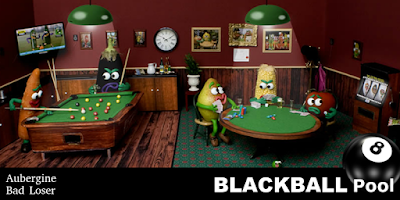 The reality is that blackball pool is a great game for players of all abilities from the occasional pub-goer to professionals. 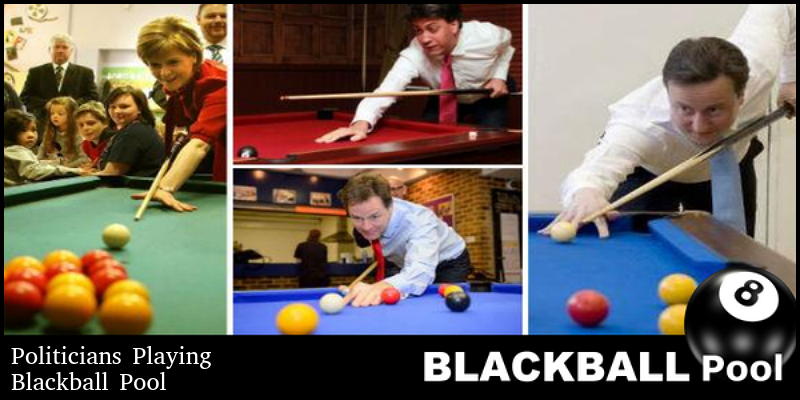 British political leaders and accomplished cueists Nicola Sturgeon, Ed Milliband, Nick Clegg and David Cameron playing blackball. 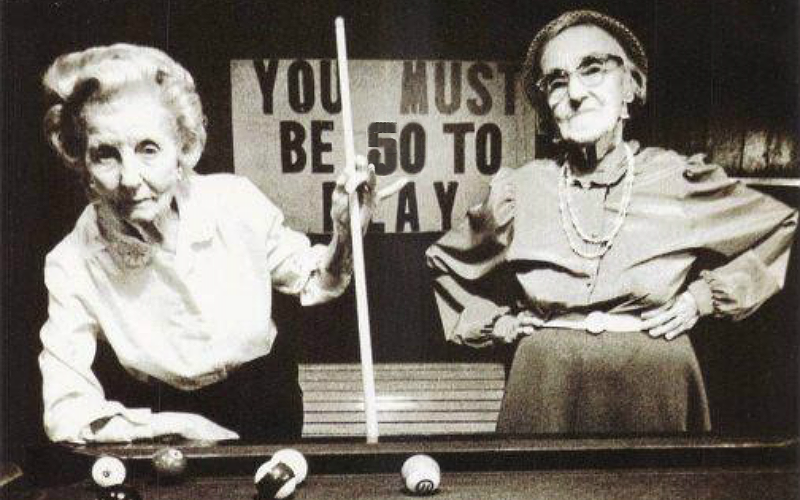 Try not to be cynical... perhaps they really do enjoy a regular game of pool and it's not just because there was a general election around the corner! A typical game between two fudgers sees them ignore obvious pots whilst attempting to manoeuvre the balls into favourable positions. The idea being there's no point in potting until you can clear the lot. Taken to extremes frames can seem interminable. 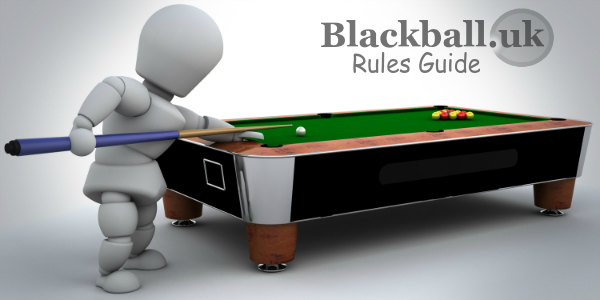 Blackball rules have done much to speed up the game and reduce fudging. Aubergine flies into a black rage whenever beaten at pool. You may have had the ill luck to meet him in your local pub. Bad losers defeated in fair competition will whine constantly and blame everything and everyone for their loss, except of course themselves. Fun to taunt, but not fun to play. 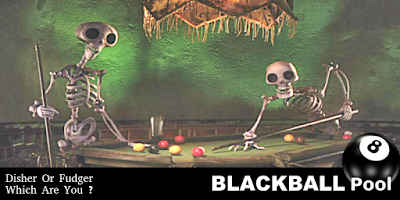 It's Friday the 13th and you haven't been playing pool to blackball rules. So don't be surprised when the monstrous wepf sneaks up on you! 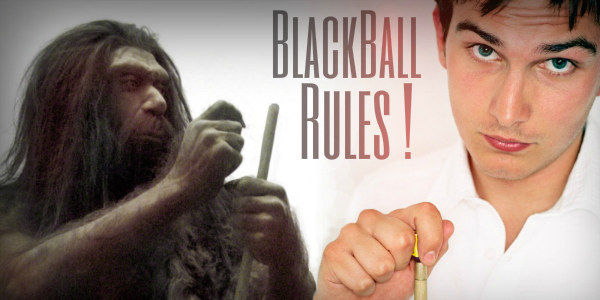 Throughout the world blackball has become the premier rule-set for the small-table game. Smoking or drinking over a pool table may damage the cloth. That looks to be what has happened here! Table coverings should in any case be replaced periodically. The fabric may be wool, nylon or a mix of the two and this determines the characteristics of the playing surface and the endurance of the cloth. 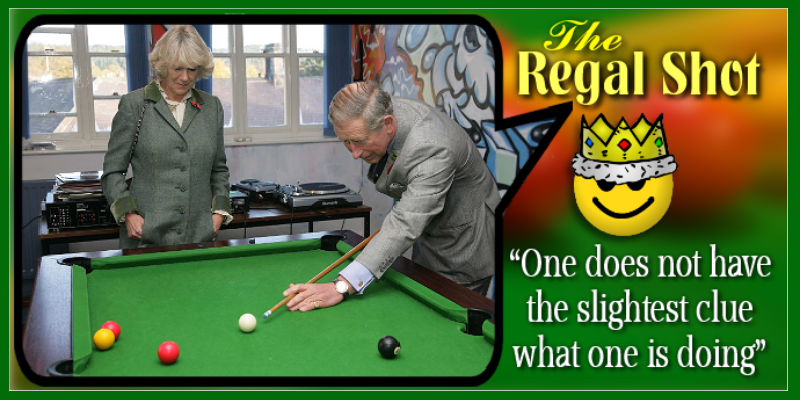 While Camilla admires his smooth cue action and regal stance Charles admits to not having a clue what he is doing. Nothing new there of course, though clearly he could not have been playing to blackball rules. 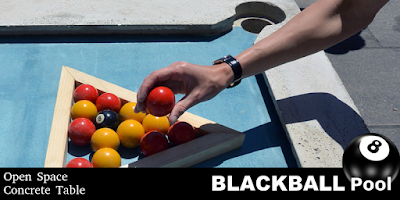 Play blackball pool and avoid confusing, obsolete rules.... plus a few blackball pool practice exercises wouldn't go amiss. 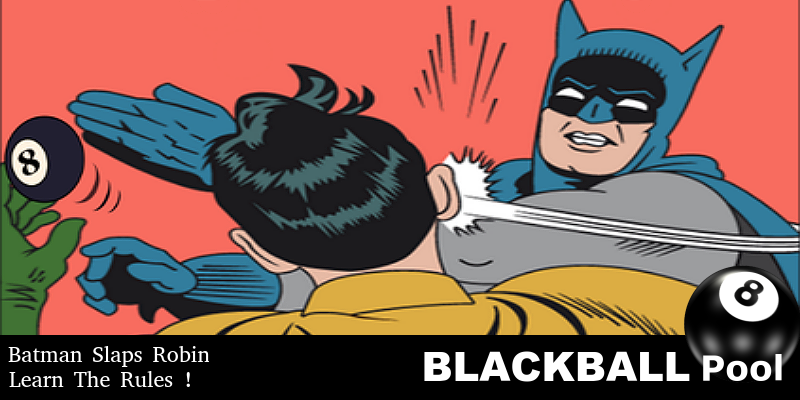 Batman discovered that Robin had not been playing pool to blackball rules and delivered a swift reprimand. So if you ever come across blockheads playing old-world, namby-pamby versions of the game just give them a good slap. Batman knows Blackball Rules ! 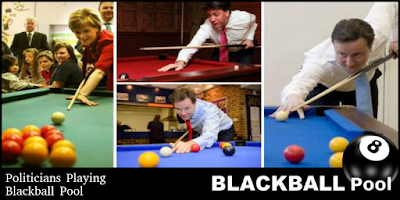 We have seen that the Queen, Prince Charles and many prominent British politicians enjoy blackball pool. Of all the celebrities that have taken up the game surely none eclipse Albert Schwarzenegger. Behold the hustling cyborg ! 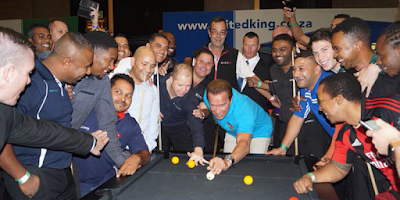 'The Terminator' is shooting pool amidst delighted blackball players in South Africa. As we age our physical and mental powers may diminish. 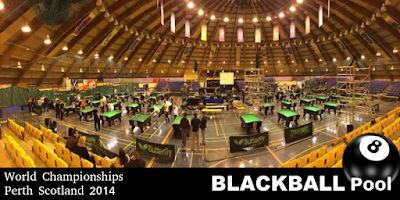 Fortunately there are blackball events for the senior citizen. There are 'Seniors' events for those of 40 years or more and 'Masters' tournaments for players 50 years upwards. Such blackball competitions are held at league, national and international level. 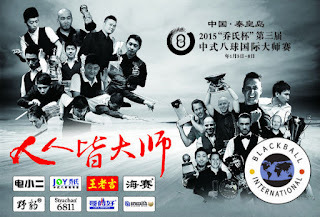 At the 2016 Nations Cup for example there were six events specifically for the older player. 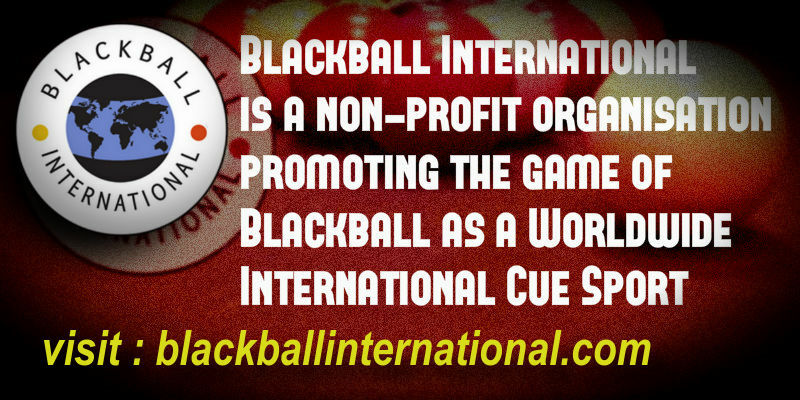 There is a twitter campaign dedicated to increasing awareness of blackball pool and encouraging participation in that sport throughout the world. 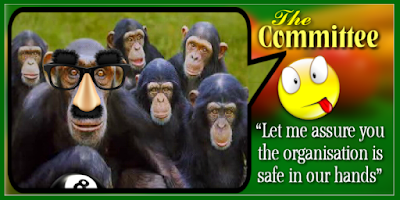 In fact both Twitter and Facebook users can show their support simply by adding a banner to their profile picture. 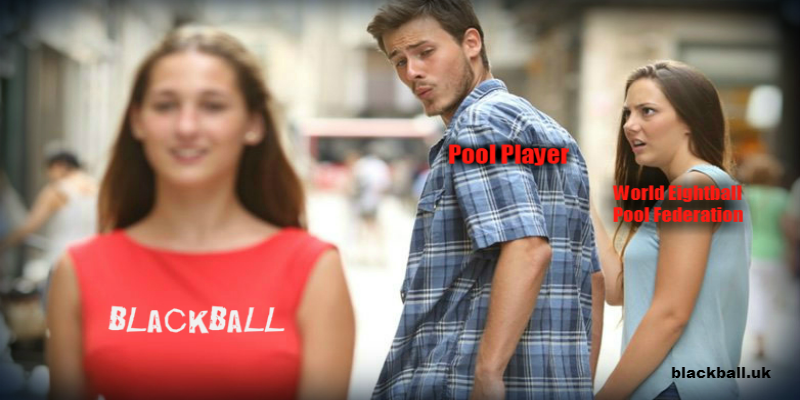 Twitter @blackballpool explains the process. There's muffin more fun than blackball pool, so if you're fruit and nuts about the game ask your mum to bake a cake. You get out what you pudding, so dish out a slice of action on the pool table and you'll soon be raisin your game and become a blackball chompian. No bun intended of course. The game of 8ball pool, now called blackball, first found it's way into the UK's pubs and clubs in the late 1960s. The transition from traditional pub games to pool was rapid. 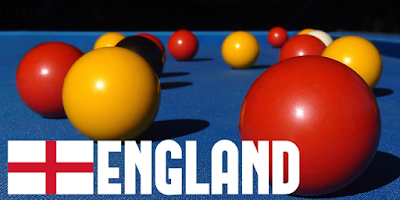 Today, throughout Britain, ladies and gents enjoy a pint of ale over a few frames of pool. Many, such as these gentle maidens, play in their local league team. This graceful likeness of an ancient Greek Olympian cueist would not look out of place in a modern setting. The magnificent statue, circa 780 BC, is housed in the British Museum. 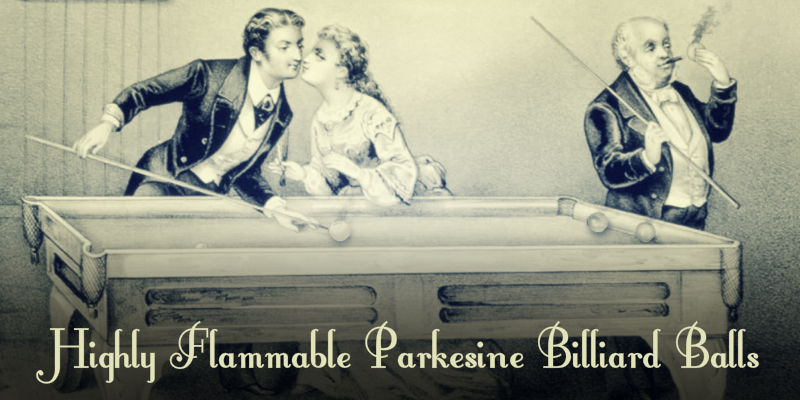 It was hewn from Parian marble during a pre-Olympic exhibition billiard match demonstrating the attractions of the sport to the admiring populace. 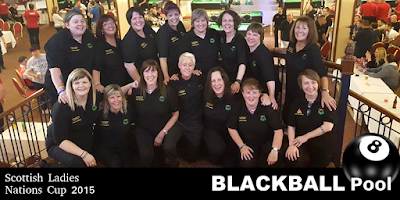 The governing bodies of blackball in the United Kingdom do not fear, but indeed welcome, surveys which analyse their organisation's performance. The organisations of England, Scotland, N.Ireland and Wales will be eager to discover that their efforts are appreciated. 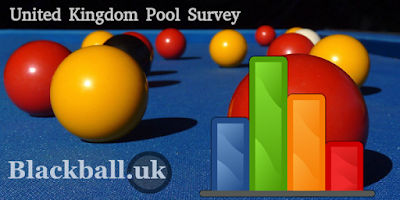 There are various blackball pool surveys on this website. An architect in France has designed a concrete pool table for use in open, urban spaces. 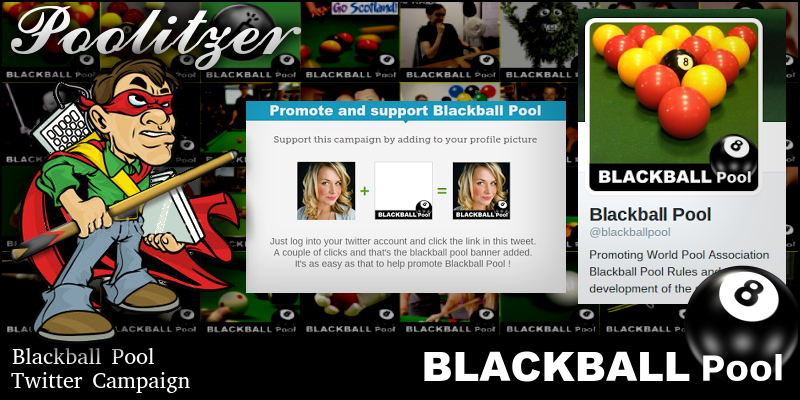 This of course brings blackball pool to the attention of the general public. There are clearly no conceivable problems with a concrete bed, rails and pockets... or are there? Perhaps breaking the balls may take on added meaning? 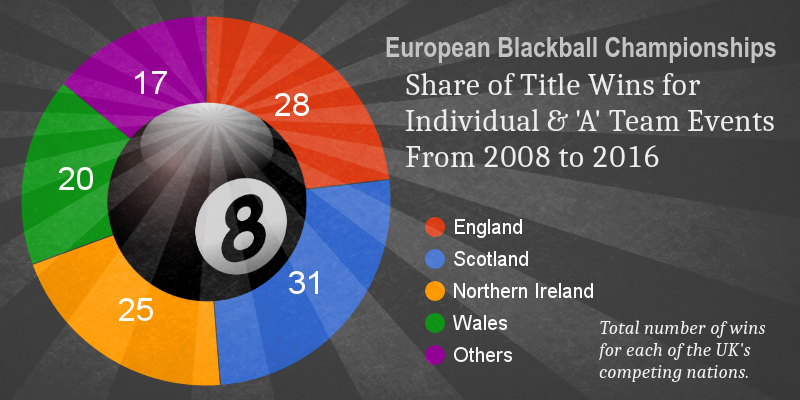 This website presents statistics on the numbers of wins for the UK's nations in the European Blackball Championships. This pie chart compares total wins for all individual and 'A' team events from 2008 to 2016. Categories included are men's, ladies, masters, seniors, under-23s, under-18s, under-15s and specials (men and ladies). How many pool committee members does it take to change a light bulb? What a dilemma! 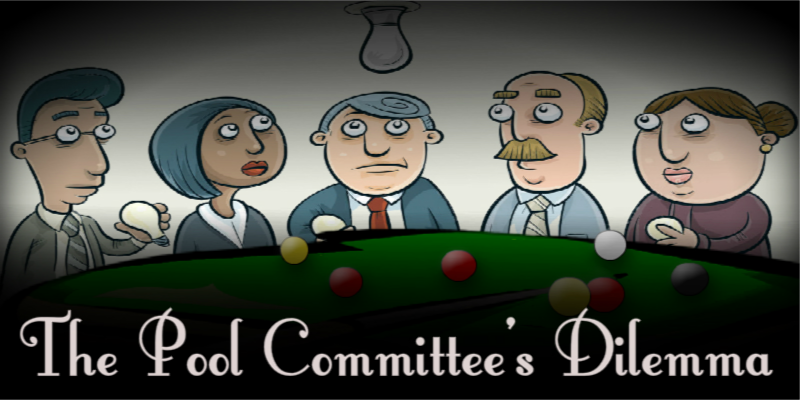 They could call an EGM, take a vote or form a sub-committee.... but most importantly of all must calculate how much they should pay themselves. Assuredly it will take a week to do what one man could accomplish in two minutes. 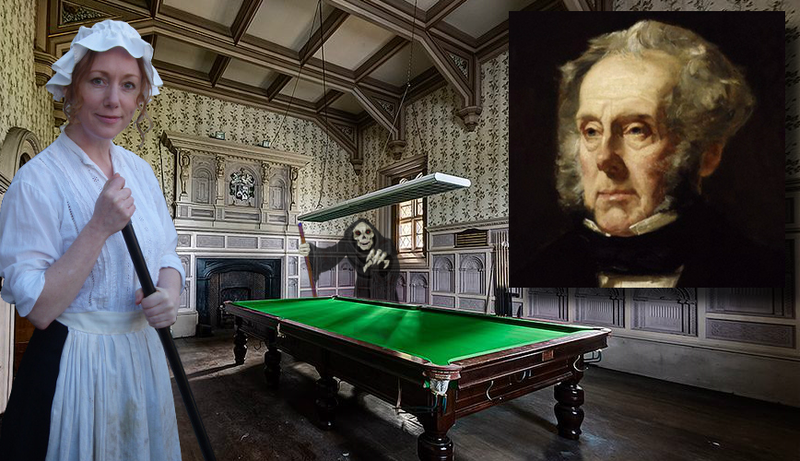 Lord Palmerston was a blackball pioneer and British statesman who served as Prime Minister in the mid-19th century. Here's a photo of his man cave which is preserved to this day. It's allegedly haunted by an apparition of the grim reaper. Tragically, in 1865 at the age of 81, he expired on a billiard table having suffered a heart attack while in hot pursuit of a pretty housemaid. Here we see another Scottish ladies pool team. Their attire is both attractive and practical. The patriotic kilt and bra are complemented by a minimalist blouse allowing an easy, unencumbered stance and cue action. The sporran holds player's essentials such as chalk, cue tips and nail polish. 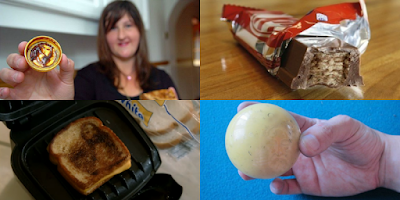 The very first plastic, parkesine, was invented by the Englishman Alexander Parkes in 1862. It was hoped that the substance would alleviate concerns over a shortage of ivory billiard balls. Unfortunately parkesine balls proved extremely flammable. Luckily they did provide an excellent means of lighting up a gentleman's cigars. 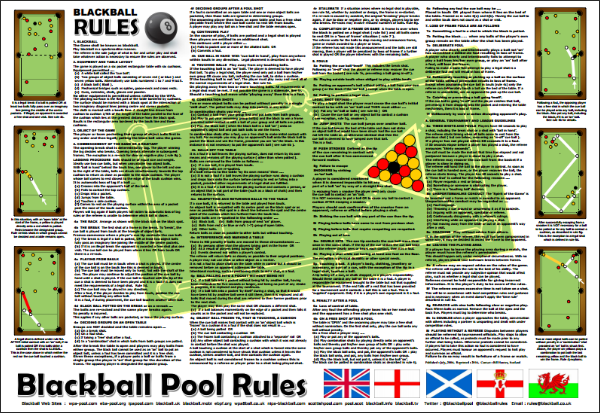 You'll find on this website a summary of blackball pool rules which can also be conveniently viewed, printed or downloaded as a PDF file. 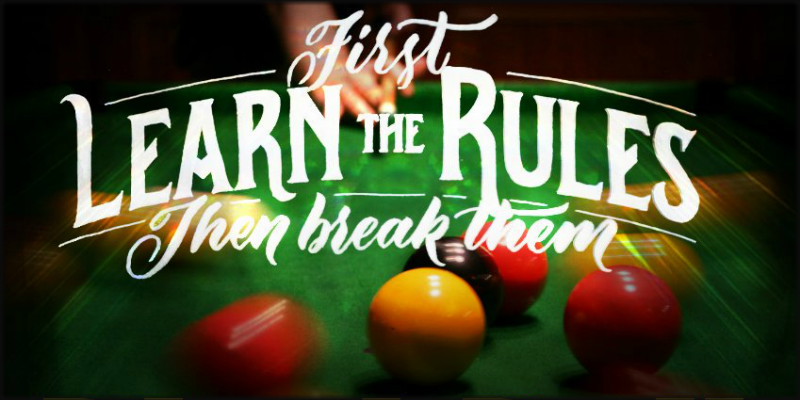 It is indeed intended to help players learn the rules, then break them... the balls that is ! Take the opportunity to ask about blackball by adding your comments below each article. Astonishing images of Jesus have in the past been discovered on a Marmite lid, a KitKat bar and cheese toastie. 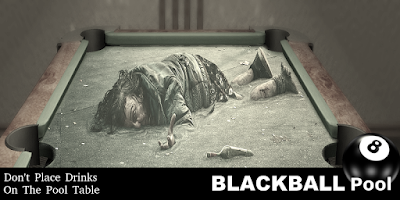 And now a likeness of the son of God has been spotted by awestruck tipplers on a cue ball while playing a game of blackball pool in a pub in Milton Keynes. 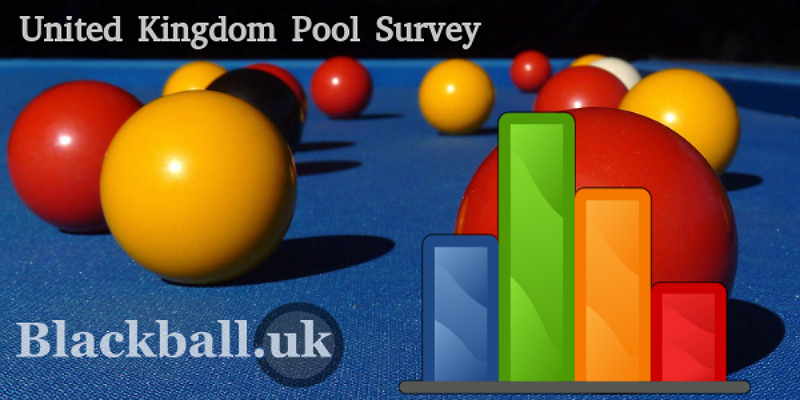 Rivalry between the UK's pool organisations promoting different rulesets has over many years resulted in an irreconcilable and bitter stand off to the detriment of the game. Inevitably there are individuals who are unwilling to contemplate unification, relinquish their grip on power or forfeit a lucrative source of income. 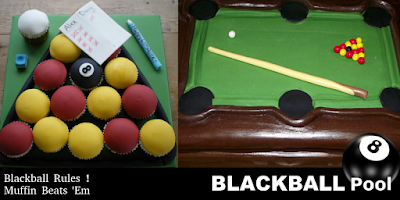 There's a quiz on this website testing your knowledge of blackball pool rules. There are 10 questions with one point to be scored for each. 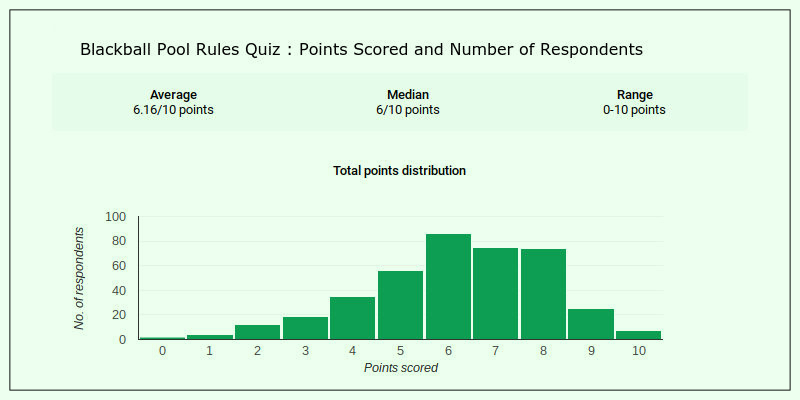 So far with over 2,240 responses the average score is just over 6 out of 10 answered correctly. 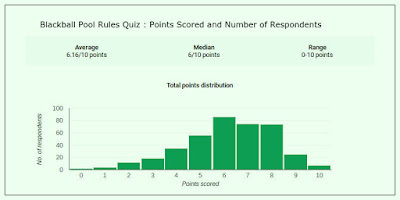 Less than 70 respondents have managed to get every question correct and score full points. Increasingly pool players are becoming aware of the superiority of blackball pool over other 8ball rule sets. 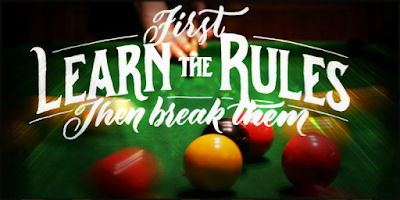 In the UK the vast majority of streamed matches are now played to blackball rules... an open and dynamic game which does not get bogged down in mind-numbingly tedious, barely watchable safety play.